For a lot of people, the biggest question about God is not, surprisingly enough, whether he exists. Instead, it is about whether God is truly good. Dinesh D'Souza, in his debates with leading atheists, quickly realized that many of those debates revolved around the question of evil in this world—how God could create a world that allowed such suffering and evil. 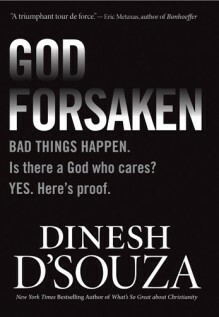 In Godforsaken, Dinesh D'Souza takes these questions head on: Does God act like a tyrant? Is God really responsible for the evil in this world? Why is there suffering in the world? For the first time ever, Dinesh D'Souza approaches this topic with historical and scientific proof and presents to the reader why God is truly worthy of our worship and love.